Are you facing any type of disturbances whenever you try to access Outlook Data PST file or MS-Outlook has been crashing constantly (along with showing different numeric errors). Might be your Outlook have been victimized by errors and now you are seeking fast and proficient method to repair Outlook PST file. Yes, Microsoft provides a free inbuilt tool called "scanpst.exe" to repair corrupt PST file which parses the damaged Outlook Data File from various steps like scanning & repairing. This tool is also known as Inbox Repair Tool and works like a first-aid kit to rebuild broken PST file for Outlook users. "Scanpst.exe" gets installed within a machine once a user installs Microsoft Outlook. Now, the biggest question which comes in front of Outlook users while poring about "scanpst.exe" that "What is the location of scanpst.exe?" Most of us are not familiar with the default location of "scanpst.exe" in the computer. 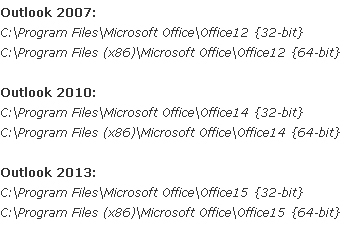 Location and the path to reach out to "scanpst.exe" varies according to the version of MS-Outlook. Via following the above path, you can reach to the Inbox Repair Tool (scanpst.exe) folder available at your system. 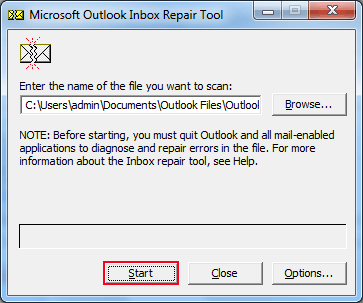 How to Run Scanpst to Repair Outlook PST File? 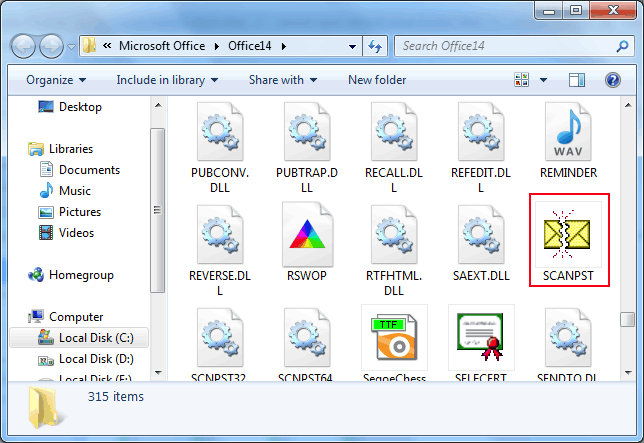 After finding the scanpst.exe utility, the next step is to understand "How to use scanpst.exe for Microsoft Outlook?". It's not that much trickier, but Outlook users should aware with the working and the entire mechanism of scanpst.exe. Choose one of the above given default location of the PST file and execute it using "Run" command. Now, you will reach at the default location of Inbox Repair Tool where you can see the scanpst.exe icon. 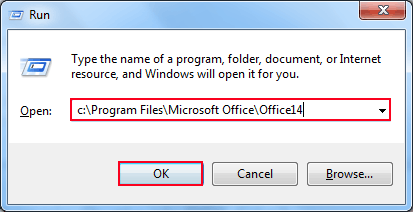 To run "scanpst.exe", you have to click on its icon, and by doing it, a new pop-up window will appear on the screen through which you can insert the damaged Outlook PST file using Browse button. After browsing the corrupt PST data file, click on "Start" button and tool begin the scanning process. Scanning process can take time as it depends on the size of the Outlook Data file. Also, this step contains eight sub-scanning phases. After completing the entire process of scanning, you can get more details about the errors and affected files by clicking on the "Details" button. 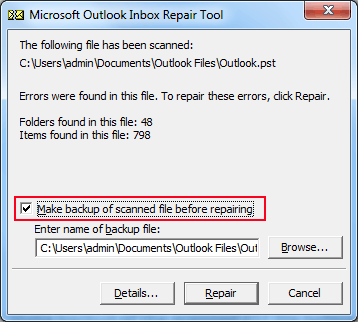 Create backup of scanned data via choosing the "Make backup of the scanned PST file before repairing" dialog box. Scanpst also gives an option to create backup of scanned file before starting repairing task on it. Finally, click on the "Repair" button to execute repairing procedure. You can directly use CTRL+6 to open "Folder List file". In "Folder List" option, you can view the repaired damaged PST file. Note : Scanpst.exe does not work on permanently deleted items of Outlook Personal Folder (PST). Conclusion : In conclusion, "scanpst.exe" is free software to repair Outlook PST file and data within it, but this utility is just capable to handle the minor level of corruption. In case of high level corruption in Microsoft Outlook, this tool fails. 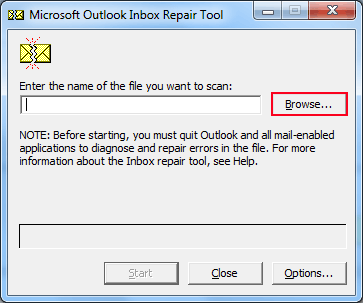 It's one of the drawbacks of Inbox repair tool that it does not designed to solve all types of errors in Outlook or especially to recover missing Outlook items. It is only possible with the help of Dumpster or any third party software like Outlook File Recovery Tool.